All homes currently listed for sale in the zip code 92211 as of 04/21/2019 are shown below. You can change the search criteria at any time by pressing the 'Change Search' button below. "The largest & most exquisite one of a kind Spanish estate at Indian Ridge with 5400 square feet on a unique south west facing .48 acre lot. Dramatic paver portico entrance leads to 2 en-suite casita bedrooms including separate living room/man cave. This gorgeous furnished property features custom wall coverings, stone floors & top of the line Wolf appliances & 4 dishwashers. Elegant french doors in the office & dining room leads to an enormous entertainment area with salt water pool/spa, custom BBQ area & garden. Massive master suite is adjacent to golf course paver patio with covered patio, electric awning, fire pit & automated electric heat system for chilly nights. Enjoy some of the most magnificent golf views over Arroyo 10,12 & 13th golf holes. This estate offers privacy and unique sun or shade orientation from this view lot. Please click on attachments to view recent upgrades. Live the Indian Ridge lifestyle in the Cortona 922 model from Toscana which includes a 4 car garage." "Truly awe-inspiring Jacaranda 2 with amazing south facing water and mountain views sure to take your breath away. The owner, in collaboration with a well-known local designer, spared no expense when remodeling this beautiful home. Complete with upgraded flooring, custom elaborate bar for entertaining, kitchen with top of the line appliances and beautiful honed granite counter tops. The gorgeous chandeliers add a modern flair to the dining and kitchen areas. The southern outdoor living space with pool/spa, fire pit and built-in BBQ is perfect for entertaining while marveling at the unobstructed San Jacinto mountain view. 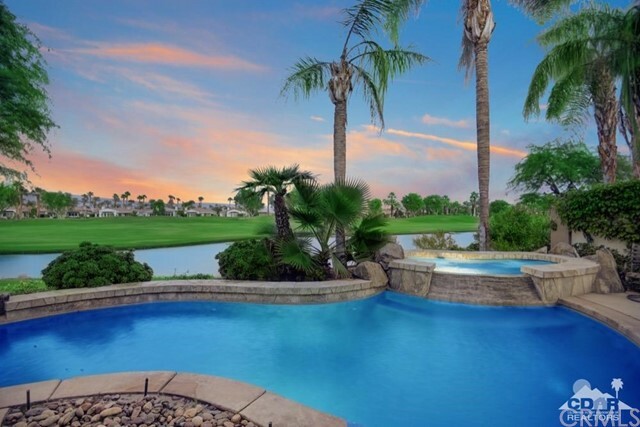 A beautiful waterscape separates the home from the golf course ensuring maximum privacy from golf cart traffic. There is private detached guest casita surrounding a cozy courtyard complete with fireplace and waterfall for more intimate evenings. This home is sold with high-end furnishings per inventory list. Club or Golf Membership available." "Spectacular home w/picture perfect views of the golf course, lakes & mountains that will take your breath away. The private courtyard complete w/fireplace & open sitting area is just the start of what is beyond the impressive & artistic iron front doors. Unique designer touches throughout including carved stone fireplace mantles, beautiful custom wood built-in's, textured custom wallpaper & much more. Paved outdoor living space, private pool w/unique water features, built-in BBQ w/counter seating & plenty additional space for entertaining & gazing at the magnificent views around you. The spacious master suite w/fireplace & sitting area overlooking the impressive views, makes for the ideal retreat. 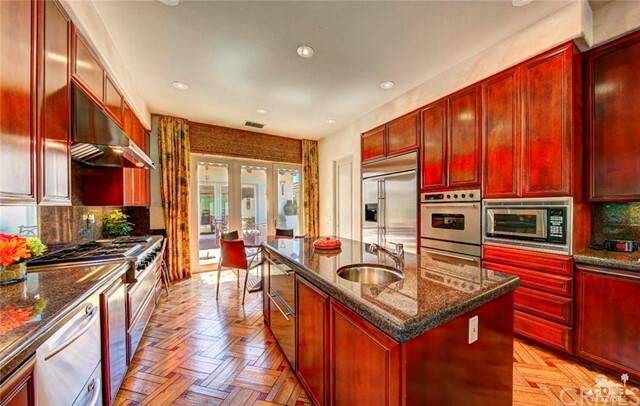 Gourmet kitchen has breakfast nook, eating bar, large walk-in pantry, large center island & plenty of storage space. Truly a unique property located within the gates of Indian Ridge Country Club where luxury & lifestyle have no limits. Furnished per inventory list. Golf Membership available." "Contemporary Designer Masterpiece! This 3,869 sq.ft. golf course home + attached Casita was featured on a popular television show! Located in the center of Indian Ridge CC, this Ocotillo 3G model features views of a lake, two greens, and IRCC clubhouse. The property has been completely updated, accented in white & customized to include high-end upgrades & renovations. Inside, no detail has been overlooked. This 4bd/4.5ba home opens to dramatic entertaining spaces, complemented by floor-to-ceiling windows, & custom quartzite floors. Interior remodel includes: All new windows, doors, sliders, floors, smooth coat & limestone walls, kitchen, all bathrooms, lighting, blinds, Caesarstone counters & new TVs wired into walls. Outside remodel includes: All new pavers & quartzite, pool, fountain, lighting, garage doors & entry gate, BBQ & firepit. This home is available with either Club or Golf Membership. Offered unfurnished, some pieces may be available outside of escrow." "A beautiful Jacaranda 1 on a premium lot with south and west panoramic views overlooking #10, #11, #12 and #13 of the Arroyo Golf course. Spacious back patio with pool and cascading spa. Large courtyard with fireplace and seating area with accent water features. The formal living room with sit down bar overlooks the golf course views with the dining room overlooking the courtyard and living room. The separate family room and gourmet kitchen with a large center island is perfect for casual living. The master bedroom has a fireplace and sitting area with views of the mountains and golf course as well. The master has his/hers vanities, dual entry oversized walk-in closet, separate bath tub and step-in shower. The guest bedroom and office/den both have large baths providing plenty of space for family and guests. The separate casita opens to the courtyard giving guests plenty of privacy. Truly a magnificent home and one not to miss. Furnished per inventory list, Golf Membership available." "Fabulous Estate Home with Pool/Spa, Casita & Spectacular Panoramic VIEWS of 4 Fairways, Multiple Lakes & Mountain Vistas. Jacaranda 2 Floor Plan featuring Entry Courtyard with Lush Landscaping, Exterior Fireplace and Detached Casita. The Gourmet Kitchen is open to the Family Room with Stacked Stone Fireplace, Entertainment System & Built-in Cabinetry. Wet Bar with 2 refrigerators & built-in TV overlooks the expansive Patio with Awesome Expansive Views. The Formal Dining Room & Living Room are perfect for entertaining guests. The Spacious Master Bedroom Suite with sitting room is a beautiful private retreat with Fireplace, Large Screen TV & 2 walk-in closets. The Patio with Pebble-Tech Pool/Spa/Waterfall has a Fire Pit & Built-in Outdoor Kitchen with BBQ Center & TV. Located on an elevated lot overlooking Fairway #13 on the Arroyo Course with Gorgeous VIEWS. Elegant Home with Beautiful, Quality Furnishings & Features throughout. Offered Move-in Ready & fully Furnished per inventory list"
"Beautifully Customized 4 BR, 4.5 BA Jacaranda 1 Estate Home w/detached Casita & Private Pool/Spa in IRCC. Features include Open Floor Plan w/Formal Dining Room, Living Room, Family/Great Room w/Wet Bar & 4 Unique Fireplaces. Gourmet, Eat-In Kitchen w/Granite Counters, Island, Breakfast Bar, Walk-In Pantry & High-End Appliances including 2 Refrigerators & 2 Dishwashers. Custom Decorated Furnishings throughout, Gorgeous Wood Flooring w/Marble insets, Plush Carpeting, Remote Window Coverings, Built-in Cabinetry, Surround Sound, Upgraded Lightning & Ceiling Fans, automatic Leak Detector shut-off Valve & leased Solar. The Spacious Master Suite with huge Walk-in Closet & Sumptuous BA overlooks the private Pebble-Tech Waterfall/Spa & Pool. The Patio boasts a Built-In Entertainment Center w/Granite Counter, BBQ, electric Awning w/wind sensor & Top-of-the-Line Outdoor Furniture. Located on the Grove Course w/Spectacular Mountain & Fairway Sunset Views. Offered Furnished per inventory minus art." "Totally Renovated & Remolded 4 BR, 4.5 BA Popular Ocotillo l Open Great Room FloorPlan w/attached Casita. Richly Appointed & Customized thru-out. Courtyard Entry features Gorgeous 11 ft Front Doors. GreatRoom w/Built-in Media Center, Beautiful Stone Fireplace. Gourmet Kitchen w/New Cabinetry, Granite Counter Tops, Top-of-the-Line SS KitchenAid Appliances, Thermador ProCooktop & Huge Walk-in Pantry. Elegant Formal Dining Room. Spacious Wet Bar features New Cabinets, Granite & Beautiful Stone Accented Walls. Lovely Master BR Suite w/Spacious Master BR/Bath with 2 Walk-in Closets. Upgrades incl: High Quality Carpeting, Stone Flooring, Panel Doors, Hardware, Designer Window Coverings, Custom Lighting, Faucets, Custom Paint, Ceiling Fans, BaseBoards/Crown Molding thru-out, Water Softener, Epoxy Garage Floor, Built-in BBQ & Upgraded Landscaping. Beautiful Mountain & Fairway Views on #18 of the Grove Course. Gorgeous & Elegant One-Of-A-Kind Home. Offered Beautifully Furnished per inventory li"
"Beautiful west facing estate at Indian Ridge Country Club! Four bedrooms, four and a half baths including casita. Approx. 4,575 sq. ft. on .28 acre lot. Features lovely courtyard entry with fireplace. Formal living room with fireplace and custom bar. 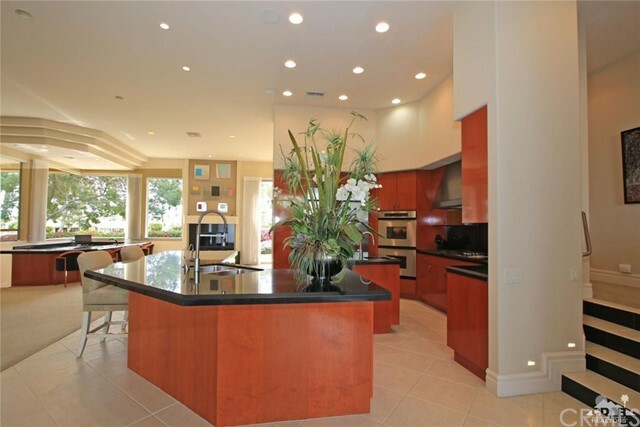 Formal dining room, gourmet kitchen with stainless appliances, center island, counter bar and breakfast nook. Family room off kitchen with fireplace and built-in entertainment center. Large master suite with fireplace, sitting area and elegant bath. Sun shade awnings are all along the back patio area featuring a private pool with raised spa and built-in BBQ area with bar. Gorgeous west facing views of golf course, lake and mountains! Offered furnished including the USC Trojans golf cart!" "Walled & Gated Estate on over 5 acres in North Palm Desert with over 9,000 square feet of living space for $1,248,000. Impossible? -- take a look at THIS VIDEO. This property is one of a kind and someone's great loss that can be your gain. The main house is 2 stories with views to the Mountains, KOI LAKE & stretches of grassy land that can still be built on. Onyx Bathrooms, Waterfall walls, Blown Glass lighting, kitchen with Wolfe, Dacor and Subzero appliances, Butler's Pantry, Billiard Room and oversized 5 car garage are just some of the features of the main house. Second story Master Suite has huge sitting room with fireplace and 2 giant customized walk in closets. First guest house is 2+2 with kitchen and laundry - very private and separate from main house. Second guest house is 1+1 with vaulted ceilings and expanded wet bar - also very private. The North-South Night Lit Tennis court is off to the North on the back of the property. 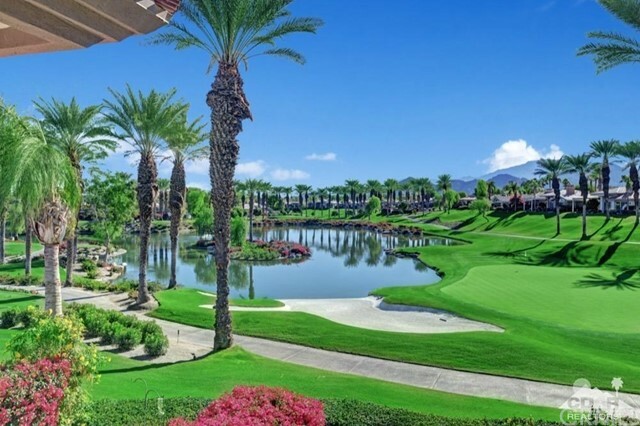 Continuous sidewalks make travel easy around prop"
"This spacious east facing Ocotillo 3G floor plan boasts beautiful mountain, lake and double fairway views. 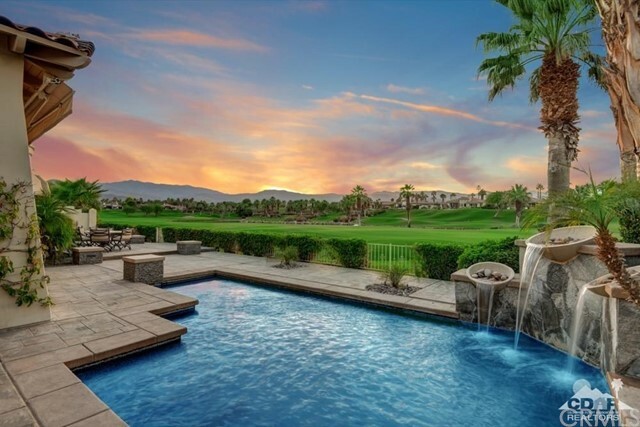 Situated on the 5th and 6th hole of the Arroyo course, relax on the back patio complete with private pool, spa with a soothing waterfall, and a built-in BBQ area that is perfect for entertaining. Enjoy the desert lifestyle in this 3,869 square foot home with a gourmet kitchen open to the family room, separate formal living room and dining room. The main house has three en suite bedrooms including an oversized master bedroom with its own fireplace, two walk-in closets, double vanity, and separate shower and bath. The fourth bedroom is a guest casita which makes it the perfect retreat for all your guests. This home has recently had a landscape facelift with new beautiful new desert landscaping. Offered furnished per inventory list. A Club or Golf Membership is available." "INCLUDED IN PRICE.. Furnished per Inventory, Golf Cart, Golf Membership AND One Years Golf Dues PAID! If you are someone who wants Mountain Views....Lake Front Views.....Golf Course Views then this is the Home for you! The Back Patio is an ENTERTAINERS DREAM! You feel like you are in the Country, with picturesque green rolling hills & little wooden bridges over the Lake. You also have a full Salt Water Pool with it's own Area on the other side of the Home. The front of your Home has an Amazing Contemporary Architectural Design. Just imagine yourself entering through Double Glass Front Doors to the following....Elegant but Warm & Cozy Front Room with Very High Ceilings & a Formal Dining Room with Amazing Views! You can enjoy your wine around beautiful Glass Rock Fireplace. The Master Bedroom Suite has a Fireplace, a Separate Sitting Room & a Built in Office. The Guest Room also has its own private bath. If that's not enough, you have a Separate Casita with Ensuite Bath and Steam Shower"
"Pristine Extended Portofino. 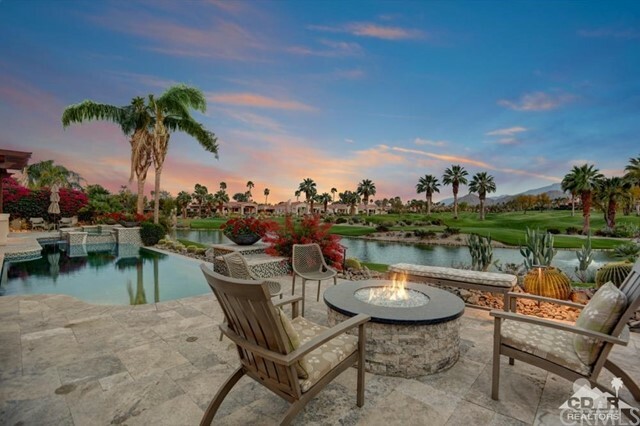 One of the most beautiful lots in Sun City Palm Desert. Over 1/3 of an acre on serene Donny Circle Lake. Estate home features an impressive circular driveway. Large river rock pond at front entrance. Professionally landscaped and lighted. Top quality artificial grass surrounds this lush estate. Newly painted interior and exterior. The main home, offers a spacious floor plan; leaded double glass entry doors, formal living rm and family rm share a cozy fireplace. Kitchen has upgraded granite countertops, all new base and crown moldings show off 12 ft. ceilings. Large GUEST CASITA with private bath. South facing back patio, sparkling pool and spa with pebble tech finish. Views of the Santa Rosa Mountains. The newer installed electronic awnings control just the right amount of sun exposure. Garage is extended, air-conditioned and heated with new insulated automatic door. 4 seater Club Car Golf Cart included in sale. $20,000 appliance credit." 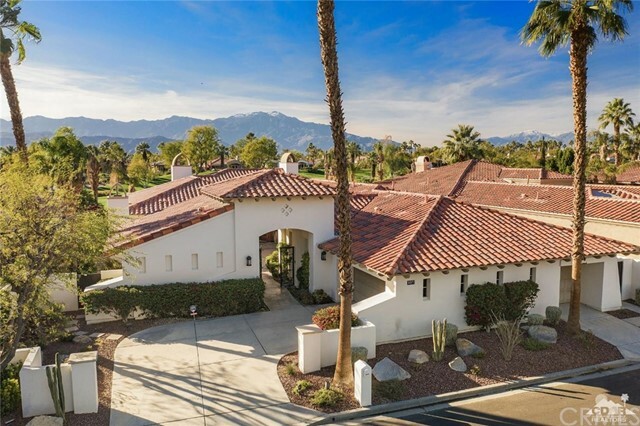 "Spectacular, 1-owner, custom built, resort-style Palm Desert estate is a 4 BR/3 BA mountain-view paradise with many improvements and amenities. Meticulously maintained, expertly designed for energy efficiency and luxury, this home has a stunning main house; an amazing swimming pool; a detached 1 BR/1 BA casita; a workshop area; a 1st class RV garage (with service bay), more! Escape the restrictions of HOA living and come to paradise! Zoned to allow for home based business use and exempt from short term rental restrictions, this is the home you always dreamed of but didn't know existed! A celebration of desert living: grand entry; formal living / dining areas; remodeled, kitchen with island; breakfast area; family room; master suite with 5-star, spa-inspired bath! Regal-sized tile; exposed stone fireplace; architectural accents; a pre-paid lease solar system (includes solar pool heating) to keep energy bills low! (So many improvements!) A perfect 1 AC +/- paradise to create memories!" "Reduced $100K! Spectacular VIEWS! One of the Best Views in Indian Ridge CC! South-Facing 4 BR, 4.5 BA Home w/Multiple Lake, Waterfall, Mountain & Golf Course Views down Fairway #2 of the Grove Course. The Smoke Tree 5 Model is the only floor plan in IRCC w/4 Bedrooms inside the home-not casita. Large manicured side yard leads to Formal Entry w/Gorgeous Marble Floors. Formal Living Room w/Fireplace, Formal Dining Room w/Wet Bar. Remodeled Gourmet Kitchen w/Stainless Steel Appliances, Large Island, Pantry & Breakfast Bar open to the Family Room w/Built-in Cabinetry & Fireplace. Spacious Master BR Suite w/Sitting Area, Stone Fireplace & 2 Huge Walk-In Closets. Large Master BA w/2 Vanities, Spa Tub & Big Separate Shower. Upgrades include Custom Window Coverings & Drapes, Flat Screen TVs, Custom Built-in Cabinets, Marble, Carpet/Tile Floors, Custom Lighting & Paint, Modern, Desert Landscaping, Stone Walkway & Patio w/Fire Pit. A Beautiful Home w/Awesome Views! Furnished per inventory list." "Hidden Gem! 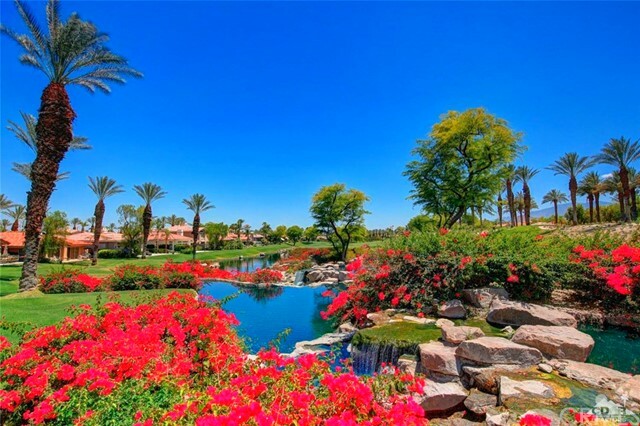 The Estates at Desert Falls is a private enclave of just 23 homes, with a picturesque man made lake in the center! 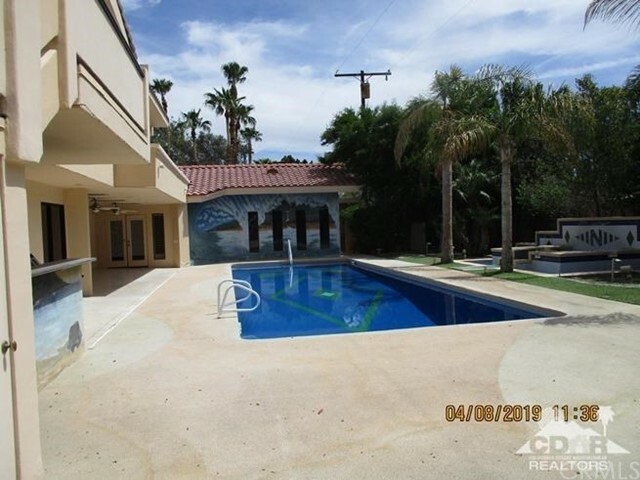 This home boasts 4 bedrooms (one could be casita with it's own entrance), 4.5 baths, in approx. 4102 SF. You enter into a lovely courtyard with a pool, spa and BBQ area. Formal living room is separated from the formal dining room with two sided fireplace. There is also a large family room with large entertainers wet bar! The master suite is oversized and has luxurious bath and huge closets! The kitchen has just been renovated with Quartz surround and Quartzite island, and is a cooks dream! Carpet is new, and the entire home was repainted in February 2019. Offered furnished! This property would make a great family retreat or if you're an investor, it also has a favorable rental history! Moderate HOA dues incl. tennis, fitness, cable and more!" "Just reduced $43000. First time ever to be listed on MLS. Spectacular Custom built masterpiece with Southern views of the first green located at prestigious Avondale Golf Club. This meticulously maintained home is expertly designed with an open concept.The dramatic entertainment spaces are complemented by high floor to ceiling windows and sliders,a sit down wet bar that seats 8 & overlooks the professionally lush landscaped backyard. No detail has been overlooked.The spacious master suite features 2 master bathrooms,a sitting area, fireplace and 2 large custom designed closets to freely move around in. The two separate have their own glass sliders and patios.One office could easily be converted to a fourth bedroom in less than a day. The 2 en-suite guest rooms are spacious.Outside includes private walled gated courtyard entry that is complemented by a sparkling pebble tech pool & spa & built in BBQ and cooking center. So many amenities that one cannot list them all. Welcome Home!" "LOCATION LOCATION LOCATION on this stunning Indian Ridge home located on a private corner lot with amazing mountain views over triple fairways. This Ocotillo 1 floorplans are highly sought after featuring 3 bedrooms inside and a large Guest Casita. Oversized Great Room with fireplace, large kitchen making any chef happy, featuring granite kitchen counter tops, double ovens, breakfast nook, walk in pantry , and a large private formal dining room. Master suite has great high volume ceilings, walk in closets , large bathroom with great soaking tub. Indian Ridge CC is on 640 acres with 1068 homes with two 18 hole golf courses, 42K square foot main club house, pro shop, outdoor sports bar, and formal restaurant . 22K square foot workout sports facility with 12 tennis courts, yet another outdoor restaurant tennis courts, a lap pool , surrounded by lush landscaping. Oversized 2 car garage with golf cart garage." 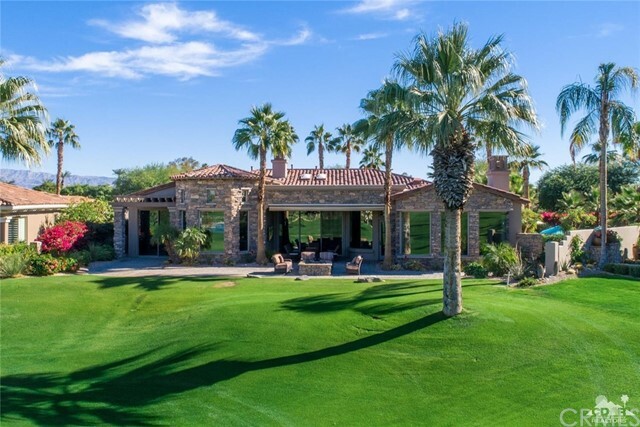 "This Ocotillo 1 floor plan located inside Indian Ridge Country Club adorns a double fairway view, overlooking a pristine lake wrapped between the Santa Rosa and Chocolate mountain ranges. The back patio is situated on the 5th and 6th hole of the Arroyo course. 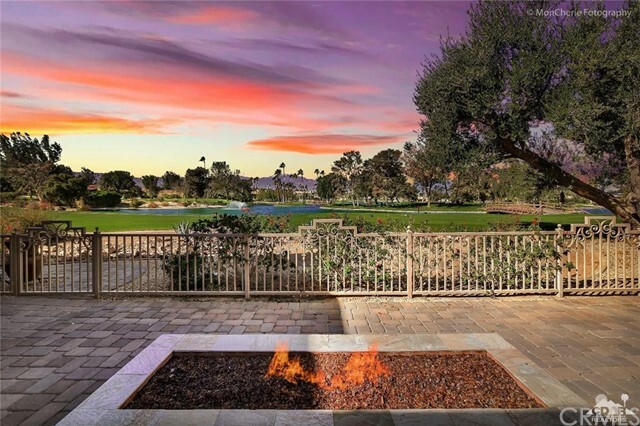 Fire up the grill as your family and friends take in the desert nights or dip in your private custom pool/spa. Kitchen is complete with newer appliances including stainless steel double oven, microwave, dishwasher, garbage disposal and Sub-Zero refrigerator. The spacious master suite has sliding doors leading to the pool area, two large walk-in closets and dual vanities. Tile flooring throughout the great room, custom shutters in all bedrooms and hallways, newer A/C units and owned soft water system are just some of the many upgrades you'll find throughout this home. Come see for yourself! Furnished per inventory list. Club or Golf Membership available." "$250K Price Reduction! Flair and Style in a Tropical setting! This refreshing, updated 3 bedroom home is located on a very private, SOUTH facing lot! Located centrally in Indian Ridge CC, this Ocotillo 3 model is cool, fun and available fully furnished with art! Enjoy the serene spa with waterfall/pool as you follow the sunset along the south/west mountains every evening. Inside you'll find a large space for entertaining, with views from the family room off the kitchen. Tile floors are new and cabinets have been refinished throughout. Large, elegant dining space has beams & chandelier. Ocotillo 3 model has a large master w/sitting area & 2 full closets. 2 en suite guest bedrooms, one that can sleep four & the other sleeps two. Located on Arroyo #2, this is a much sought after location. Garage is 2-car plus a separate golf cart garage. This home is an easy golf cart ride to the all the social, golf, tennis and spa facilities in IRCC! Club or Golf membership is available with this home." "West facing Pool/Spa Ocotillo 2! This lakefront home has panoramic south and west views of mountains, water & course over Grove #16. Back patio has been completely re-done...New pool & spa, fire pit, built-in BBQ and awnings! Perfect for the indoor-outdoor desert lifestyle! Offered furnished per inventory, this stunning home has been highly upgraded with travertine floors, granite, marble and more. The Ocotillo 2 has an open floor plan which offers incredible views from the living room, wet bar and family room. The master bedroom is privately located off the front courtyard. Both guest rooms are ensuite. Garage is 2-car plus a separate golf cart garage. This home is centrally located in the club with easy cart/walking access to the clubhouse. Both Club and Golf memberships are available for this home. (Click on attached docs for floor plan). NOTE: A few photos have been Virtually Staged with furnishings/art/accessories." "This is a one of a kind, unique luxury home located inside Indian Ridge Country Club. The builder customized this magnificent two-story home with attention to detail through out, including designer furnishings, French limestone floors, custom wine closet & so much more. The wall that divides the kitchen & family room has been removed, creating a open concept floor plan that is unique to this model. Craftsman cabinetry, center island & stainless professional grade appliances complete your dream kitchen including an extra commercial refrigerator/freezer. Endless views of water, golf course, along with the southern mountains will put you in a transe. The spectacular master suite is complete with a fireplace, custom walk in closet as big as a bedroom, large master bath with marble walk in shower & separate jacuzzi tub. Did we mention the spectacular views from the master bedroom private patio? This is a must see home! Furnished per inventory list. Club or Golf Membership available." "Stunning highly upgraded and huge 3 bedrooms 3 1/2 baths 4203 sq ft single story home with a fantastic view overlooking a double fairway. This is the largest home in the tract. Swimming pool and BBQ in front patio. The third bedroom has an additional 400 sq ft added to the original floor plan and is now used as an entertainment room/office. It has a 65 inch built in TV and the couch has a hide-a-bed and an en suite bath so can still be used as a guest bedroom. The master bedroom has a fireplace and a sitting room. The master bath is very large and contains a large walk in shower with a separate tub and separate toilet room with water saving toilet and bidet and over 200 sq ft of walk in closet space. The second bedroom was designed as an additional master bedroom and bath with a large walk in closet. The kitchen has new double ovens and a sub-zero refrigerator, warming oven and wine refrigerator with large center island and ample cabinet space. A morning room is adjacent to the kitchen with couch and breakfast table. 75 TV mounted on wall for viewing. Formal dining room off of kitchen. Living room has full view of golf course and contains a fireplace, step down bar with ice maker and sink with ample cabinet space. There is an oversized 2 car garage with space for a golf cart and plenty of storage space. Security system, whole house filter system, 2 water heaters, 3 air conditioners, large separate laundry room**2200 sq ft of patio space with putting green! Much more!!" "South facing stunner! 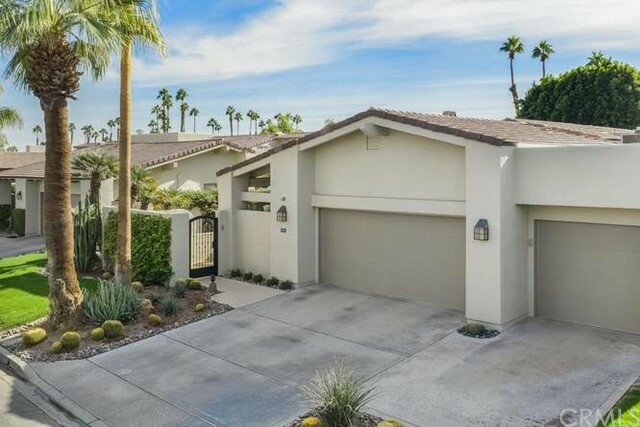 This Palo Verde 3 with guest casita is a one of a kind treasure and a home that buyers are sure to fall in love with. The expanded elevated lot and patio include an outdoor kitchen area and in-ground spa overlooking the expansive water and views of the San Jacinto mountains. No detail has been missed in this upgraded home including custom cabinetry, high-end stainless appliances, 24 x 24 Travertine tile flooring, granite counters, and fabulous furnishings. The office is smartly designed with desk, leather sofa sleeper and fireplace. The courtyard entry boasts flagstone pavers and a soothing stack stone water feature, the sounds of which will delight your family and friends staying in the well-appointed guest casita! This home is sold furnished per inventory list, Club or Golf Membership available."